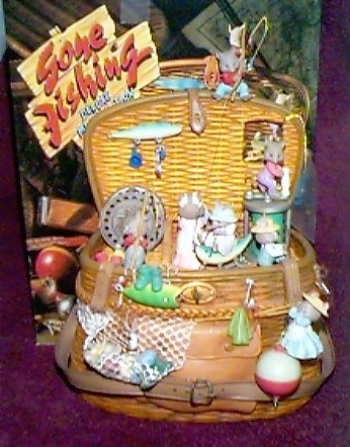 This musical features fishing gear in a tackle basket. 8 1/4" tall X 7 1/2" across X 4" deep. Plays "In the Good Old Summertime". Something fishy is going on when a clan of mice sets up housekeeping in a creel. The family has 'Gone Fishing' for the day. Junior's got a nibble . . . his line is caught on sis's rockin' horse. While dad snoozes in his hammock, his drink moves thanks to the mischievious mouse trying to reel it in. While Mom's clothesline moves back and forth, lil sis is experiencing 'butterflies' as she rides the bobber. A.C. adapter included.